Pharmacy franchisor Shoppers Drug Mart has entered into an agreement with Great-West Life to expand its coverage of medical cannabis by delivering its Medical Cannabis Coaching Program. Discover your perfect franchise opportunity. Get the latest information on franchising in Canada via e-mail! By Joseph Y. Adler When prospective franchisees start seeking advice about purchasing a franchise, they are often in a state of euphoria about what they perceive to be the most exciting business opportunity in the world. Not much could dissuade them from pursuing it. Find your franchise opportunity. 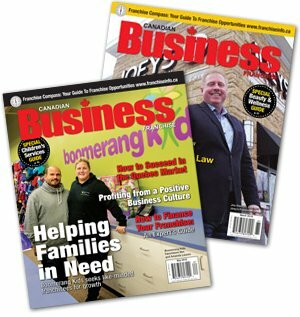 Subscribe to Canadian Business Franchise.